The air temperatures in Marin have been pushing close to and into the 90s for more than a week now. The urge to increase our irrigation times seems natural to compensate for the heat, yet the Weekly Watering Schedule is saying to water less now than was suggested at the beginning of May. At that time, the evapotranspiration (ET) was 1.57 inches with a 106% Watering Index, compared to 0.97 inch with a 66% Watering Index this week. You might ask why plants need more water in cooler spring than when the temperatures soar in early fall. The truth is air temperature only plays a small role in determining how much water our plants need. But first, some background on how we determine the Weekly Watering Schedule: The California Irrigation Management Information System (CIMIS) is a network of weather stations throughout California. 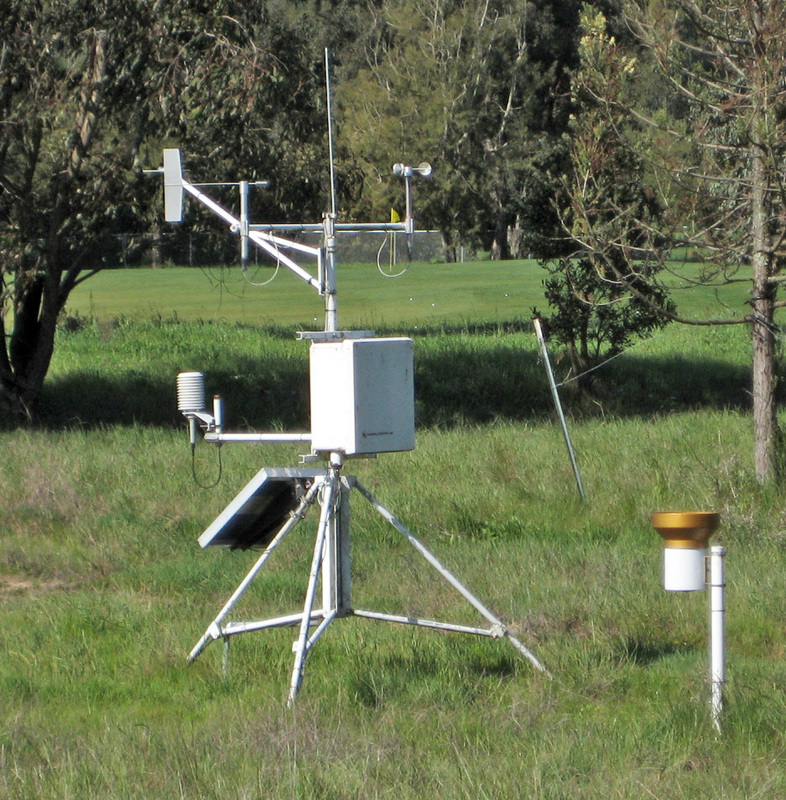 Our CIMIS weather station is located near Point San Pedro Road in San Rafael and collects data points throughout the day that determine plant irrigation needs. Besides recording air temperature, our CIMIS station has instruments that measure soil temperature, hours of solar radiation, wind speed and direction, humidity level, and rainfall. We use all the collected data to calculate how much water is evaporating from the soil and transpiring from plants. Those results are transposed into inches. This tells us how many inches of lost water we need to replace with irrigation to maintain the optimal health for our gardens. If you are following the suggested irrigation runtimes but find that some of your plants are wilting during the fall heat spells, check the soil moisture level. Oft times, the soil has adequate water available to the plant, but the plant cannot draw the water up to the leaf fast enough (usually found in very large leaf plants). In this situation the plant will droop but recover by the following morning. If you are uncertain how much water your plant is receiving, you can experiment by placing an empty low can (such as a tuna can) near your plant before you irrigate. After the station is complete, measure the amount of water in the can and multiply that times the number of days you irrigate in that area each week. Check that number with the given ET loss per week to see if you are replacing what the plant loses. For example, if the can collected 0.25 inch and you irrigated three times a week, you are replacing 0.75 inch. Last week the ET was 0.91 inch, so if you only applied 0.75 inch last week you are not applying enough water to sustain the health of the plant. To really do this test correctly, it would be best to distribute several cans throughout the area being irrigated and total the number of inches in the cans and divide that number of inches by the number of cans you have placed out. That test is known as distribution uniformity and is getting into a whole different topic for next week’s blog! Have a great weekend, and stay hydrated if you are working outdoors. The tug of my heart found me traveling to Bend, Oregon, to see six grandchildren where they reside. The road trip was a surprise as I expected to see some fall color in the trees, but summer was holding on to various shades of green. Nonetheless, the scenery was delightful. My son Randy and his family live on the south side of town in an area that reminds me so much of Lake Tahoe. Thick groves of aspen and pine trees grow in profusion. Sitting on the back deck surrounded by this woodland brought such peace. The twins, Grace and Chris, pointed out the new fence that replaced the 6-foot fence that once stood at the back property line. They were quick to let me know this fence was built much shorter to accommodate the deer trail through their yard. The gate between the two yards was constructed with a latch enabling the gate to remain open for deer access. What a concept! 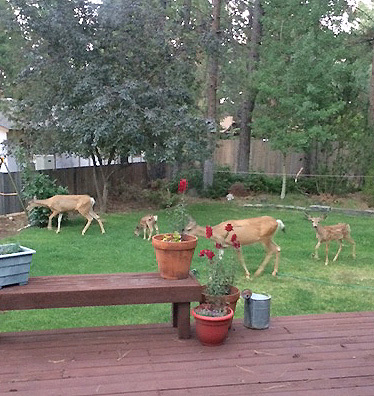 Living with deer requires a different kind of landscape and attitude. As I looked around my son’s yard, I noticed he uses plants that are not often browsed by the beautiful four-legged friends. 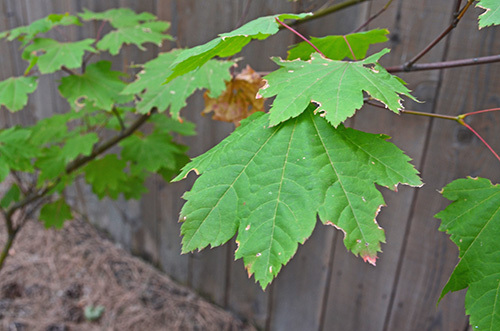 Native plants such as Mahonia (Oregon grape) and Acer circinatum (vine maple) border the perimeter of the garden. I was told more than one doe used this area for birthing. I could envision the deer resting under the vine maples in a month or more when these plants would show their true color combination of reds, oranges, and yellows. Randy and I walked around the garden in the morning and found a doe and her two fawns nestled under the big pine trees. I marveled that the deer didn’t browse on the annual color on the back deck. It was almost as if they respected the working relationship between man and beast. As we walked, we spoke of adding a small natural stone basin of water to quench the deer’s thirst. The basin could be positioned to easily capture the spray of water from the lawn irrigation system, eliminating the maintenance to keep it filled. The concept of living with nature, instead of fighting it, made sense to me. Often we build high fences or spray our plants with repellent to discourage the deer in our midst. Randy and the children’s actions gave me pause for thought. Foraging rabbits and squirrels caused my own vegetable garden to fail this year. I fought their presence instead of providing what they really wanted in the drought-stricken land. As I lamented the frustration of lost vegetables, Jack would remind me that the night marauders were only hungry. It made me wonder how much of the garden would have been untouched had I provided feed for them. My trip to Bend taught me that the winning combination of living with wildlife is to provide shelter, food, and water for them to live in harmony with us. How have you remedied the wildlife situation in your garden? Are you fighting a losing battle by keeping them at bay? Or do you employ various strategies to live with them? But not anymore. Carleen and her family recognized that the culprit behind their high summer water use was what was going on outdoors. Keeping their yard and garden green was making their household less green. 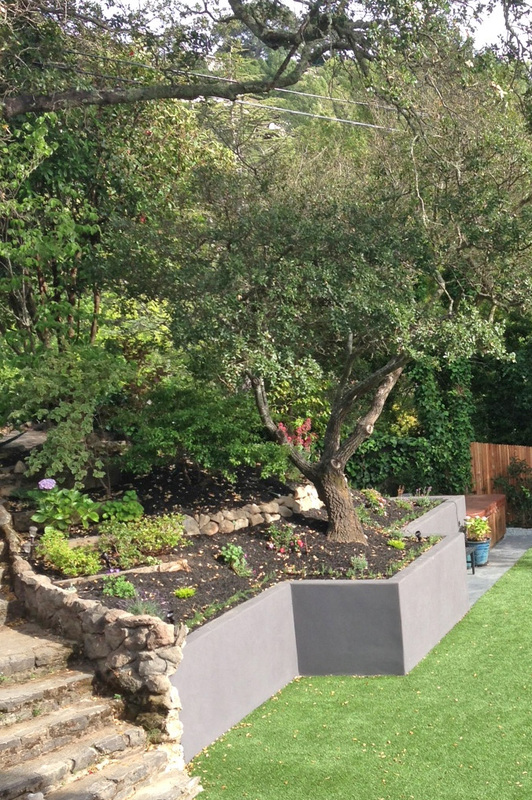 As part of a yard renovation, they got rid of their lawn and installed artificial grass (made partly from recycled product), replaced high-water-use plants with California native drought-tolerant ones, and abandoned their old irrigation system in favor of a new drip system. Carleen also asked her kids to stop washing the car with the hose and switched to a waterless car wash method. When Carleen opened their most recent water bill, she found for the first time that they were below average in the summer. Her family’s consumption went from 25,000 gallons last year to just under 15,000 gallons for the same period this year. By saving water they are saving energy, and as an added bonus they are saving money, too—their “guilty secret” summer bill plunged from $367 to just $100! Are you an MMWD customer with a conservation success story to share? Tell us in the comments below, or email us and we may share your story on our blog. The email messages and news about drought conditions are flooding my inbox and my senses. Pictures of Lake Oroville and Folsom depict mere ribbons where large bodies of waters once resided. 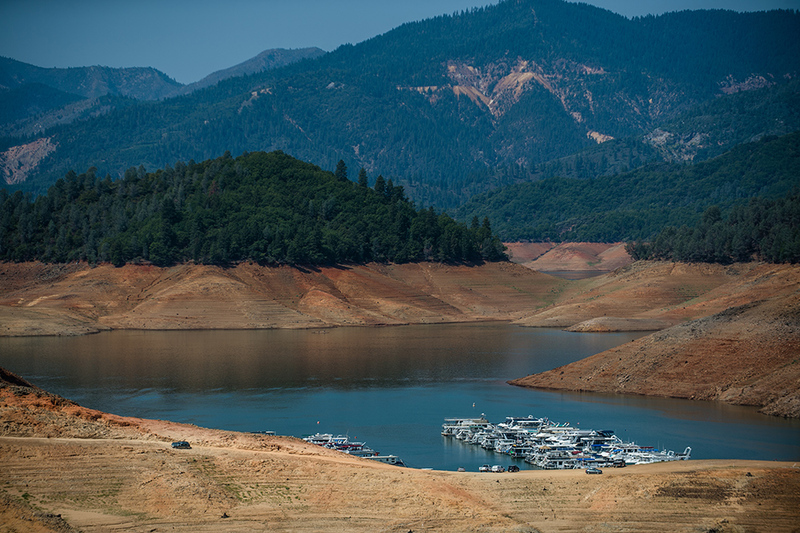 Driving by Shasta Lake and the Pit River, I experienced a shocking eyewitness view of the voids where water once lapped banks and rippled along the water course. All around are signs of extreme drought conditions. MMWD is faring better than much of the state, with reservoirs at 92% of average storage for this time of year. Those numbers reflect the great job everyone in Marin is doing right this minute. What amazes me is that the district’s seven reservoirs are totally dependent on rainfall. They are not fed by large rivers or snowfall from afar. The water saved in those reservoirs is the direct result of local weather conditions and local water conservation. With that said, congratulations on the job you are doing! And what are you doing to help others find tricks to employ in their homes? I know MMWD is offering a variety of resources from on-site water-use surveys, to rebates for water-saving devices, to free shutoff nozzles for garden hoses (pick up yours at the Corte Madera office). But my curiosity and thirst for knowledge want to get more personal. What are you doing? How are you educating your family about water conservation? What tips can you share that others can utilize? I, for one, sadly let the vegetable garden go. Not only are we conserving water by eliminating the irrigation to that area, but the multitude of squirrels and rabbits have devoured every fruit and veggie that began to resemble something edible. The mild winters have made way for prolific garden predators looking for anything to eat. Except for the asparagus, no vegetation was spared from the night marauders. Chain-link gates across the greenhouse door (left open for ventilation) made a perfect ladder for visitors to gain entry to coveted tomatoes. Nothing was spared including the basil, parsley, and Swiss chard. Forgive my rant. Once again, I digress! You might be interested in another conservation method that works. You can slightly stress perennial plants that will go dormant, such as peonies. Keep roots just moist enough, but cut back or thin out vegetation to minimize the irrigation needed to keep viable what little foliage is left. The remaining canopy will still provide shade for the roots and crown. The smaller canopy of the plant will reduce the water needed. (The Weekly Watering Schedule lists irrigation needs for different canopy sizes.) Be advised not to remove more than a third of any plant when pruning, and make your thinning cuts back to an outside bud. Thanks for taking the time to share what led you to a successful conservation effort. Keep up the great work! Over the years, many questions have popped up regarding the best way to irrigate. Some customers asked if it was best to irrigate a little every day, or every two days, etc. Others asked if it was best to irrigate in the morning, afternoon, or evening. Some wanted to know what irrigation method is best for hillside planting. And, over the years, many of you have heard me say to irrigate effectively as well as efficiently. To irrigate efficiently is to apply water to the root zone of the plant and replace just the amount of water lost due to evapotranspiration (ET). ET is the loss of water through transpiration from plants (we perspire, plants transpire) and through evaporation from soil. MMWD uses data from its weather stations to calculate the rate of ET and generate the Weekly Watering Schedule. Replacing just the amount of water lost keeps the plant and surrounding areas in balance, but this alone is not necessarily effective. For example, suppose the ET loss for the week is one inch. A person could water a tiny bit daily, replacing just 1/7th inch of water each day to total one inch for the week. However, that tiny bit of water would barely wet the surface of the ground and evaporate quickly. Much better would be to apply a half inch twice a week or one inch of water weekly to get down to the root system of the plant. Water at that depth will take longer to evaporate—especially if there is a thick layer of mulch on top of the soil. That would be effective as well as efficient. Another means of being more effective is to avoid irrigating when it’s windy or during the heat of the day. Typically, there is little wind during the evenings or early morning. If you set your controller to turn on after sunset or before sunrise, you’ll save water and comply with MMWD’s new daytime irrigation prohibition. Since your irrigation system will be in action while you sleep, do a quick monthly system check—running each station for a minute—to look for blown emitters or misaligned nozzles. During the month between system checks, simply look around in the morning. Do you see a puddle? Are the sidewalks wet? Are you finding dry spots or wilting plants? These are signs that adjustments or repairs may be needed. Watering hillside plantings is a challenge in anyone’s book. There are steps that can be taken to make this irrigation challenge both effective and efficient. First, use very low-flow methods of irrigating such as drip emitters or MP rotators for overhead irrigation. Next, use multiple start and stop times on your controller. Some controllers call this the cycle/ soak program. Water for a brief time before you see any sign of runoff. At that time, program the controller to turn off. Let that water soak into the hillside for 20-30 minutes before setting the controller to start again. 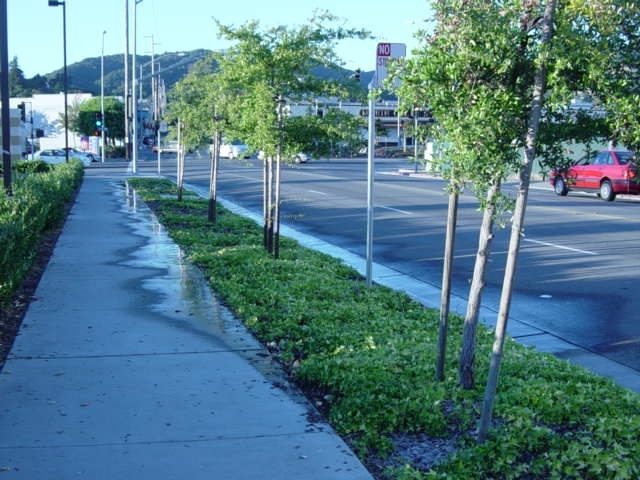 Continue the cycle/ soak until the water penetrates to the depth of the root system—but not until you find water run down the street! Be water smart. A few moments to adjust your controller will yield water savings and happy plants. And please take a few minutes to become familiar with the current water conservation regulations. In response to the continuing drought, the State Water Resources Control Board announced new emergency regulations in July designed to reduce outdoor water use statewide. To fully comply with the state, on August 19 the MMWD Board of Directors adopted an ordinance amending the water waste section of the district’s code. Most of the new state regulations mirror water waste restrictions MMWD has had in place for some time. However, two changes may affect you: Irrigating between 9 a.m. – 7 p.m. is prohibited, as is using a hose without a shutoff nozzle. We’ve long recommended that our customers follow these water-saving practices; now, these recommendations are requirements. FREE hose shutoff nozzles are available at MMWD’s Corte Madera office (one per household, please).